A contract between leading city hospitals and 1199SEIU allows members to receive comprehensive health coverage for free. With the current contract expiring July 15, the hospitals would like to restructure benefits — but the union says that would leave 55,000 low-wage workers paying for some of their health care costs out of pocket. 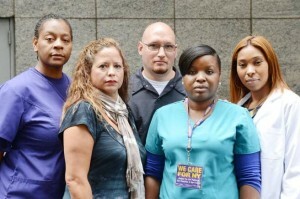 The powerful union representing workers at the city’s private hospitals has taken on a new fight: preserving free health care for its own members. The three-year “master contract” between leading hospitals such as NYU-Langone Medical Center and 1199SEIU, which covers 110,000 nurses and healthcare workers, is set to expire July 15. Under the current contract, all union members receive comprehensive health coverage for free, with no co-payments and no premium contributions. But the League of Voluntary Hospitals and Homes of New York — an employer group representing 109 hospitals, nursing homes and clinics — says it contributes more than $900 million annually to the benefit fund for workers and wants to restructure the benefits to pare that cost.